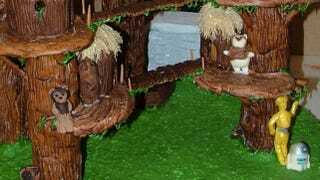 Something tells me the Ewoks may have gone over better if the forest moon of Endor (and all of its denizens) were made out of gingerbread and a metric ton of fondant. Also, the Empire's machinations might have actually worked if they constructed the Death Star entirely out of Rice Krispies Treats. This ridiculously complex edible village by Canadian baker Infinite Yums turns our minds to such missed narrative opportunities. Infinite Yums recently built this pastry planet for a charity auction and even went so far to rig the Death Star with green LED lighting. It's unclear if anybody actually consumed these feral frosting teddy bears, but your views on said issue are likely determined by the Ewok Line. Here are some of this delicious diorama's best scenes.